welcome back, we hope you enjoyed your winter break as much as we did! we've had our share in family-time, friends-time, great food, and as in my case – getting over a cold. now a new year begins (again, far too often, far too soon as it seems) and it's time to regroup. many use the beginning of a new calendar year as an opportunity to reconsider goals, plans, and priorities in life. while i will keep many of my thoughts on this offline, i'd love to share some of my creative goals with you. one goal is to continue growing our artsy ants shop. 2013, especially towards the end, has been a great year for us. 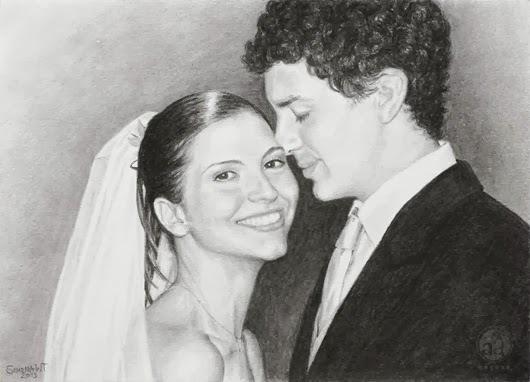 i've had the privilege of drawing many custom portraits and have thoroughly enjoyed working with our wonderful clients. and i'm not just saying that to flatter anybody, i really mean it, it truly has been a pleasure. when we moved into the home we live in now, it didn't take too long until i took over the sun room/dining room as my office and art studio. whenever we want to eat at the table i generously clear a few square inches, just enough to fit our plates and drinks. it gets worse when i paint, all the colors, the easel, etc. take up extra space. so when i'm finished with a paint project or two i need to put up my painting supplies and it much too often takes several weeks until i have enough time to make it worth getting everything back out again. as a result, i'm considering changing my art studio setup a bit to allow for some of the paint supplies to stay out, this way i could paint more often. that is one of my goals for the year 2014.
along with that goal i wish to finally start my cloud project. i've been wanting to get involved with studying clouds, not so much the scientific aspect, but the visual aspect instead. clouds are not only one of the most interesting aspects of any nature artwork, but they are part of our family heritage, thus my particular interest in cloudscapes. 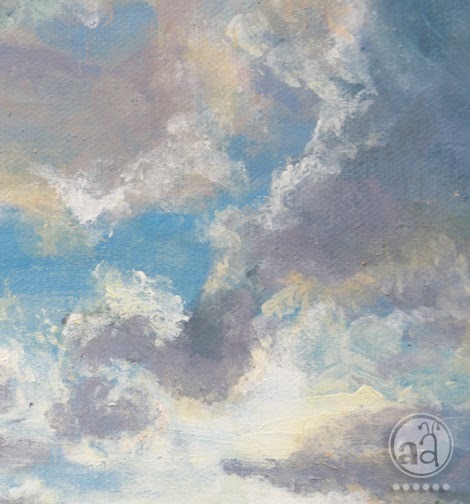 i think the first time i really painted clouds, paying attention to how they are supposed to look like, was a few years ago (see this link and the photo above). somehow i even prefer the close-up pictures of the cloud details. and this is exactly what i want to do more of. as you can read in that post, i already talked about this project back then. but this year i want to turn the talk and dreaming into action! have you also set goals you'd like to achieve this year? tell us about them, we'd love to hear! That portrait is beautiful. Wow! I did a triple take of the portrait, so lovely!!! My goals are to knit more, as predicted continue my daily writing habit and enjoy life and watching my kids fly the nest!! My goal is to spend more time doing what I really like-drawing, painting, taking photographs of beautiful things or just being creative in some way.